The International Foundation for Integrated Care (IFIC)’s International Conference on Integrated Care (ICIC) is the premiere annual event for global integrated care stakeholders, gathering researchers and practitioners in integrated care from all corners of the globe. The fierceness with which each individual pours passion into each day of work is evident in the faces and conversations one has over coffee, in hallways in between sessions, and certainly in each and every presentation one attends at these conferences. If you have not yet been an attendee at an ICIC, I suggest that you prioritize this professional development experience into your organizational budget for next year, as the congress meets in Toronto for the first annual North American Integrated Care Conference, or in Croatia for ICIC 20. It was truly both humbling and inspiring this year to be amongst an estimated 1400 kindred spirits in San Sebastián, Spain, all furiously working to improve care for all patient populations. While I often get quite swept away by the incredible spirit of collegiality and encouragement to Keep On Doing this important work in my neck of the woods, the task before me is to share the key takeaways from this particular conference. So, I begin with some of the major themes that became apparent throughout this year’s gathering. First was the focus on vulnerable populations. In recent years, significant research and practice in both the US and abroad has been aimed at improving care and quality of life for older adults and in maternity/postpartum care. It is clear that these populations, among others, continue to gain attention, and it was inspiring to see many posters and presentations focused on innovation with these populations around the world. I would be remiss not to mention the incredible work of midwives around the world in catalyzing and leading integration improvements for women and families in their communities. 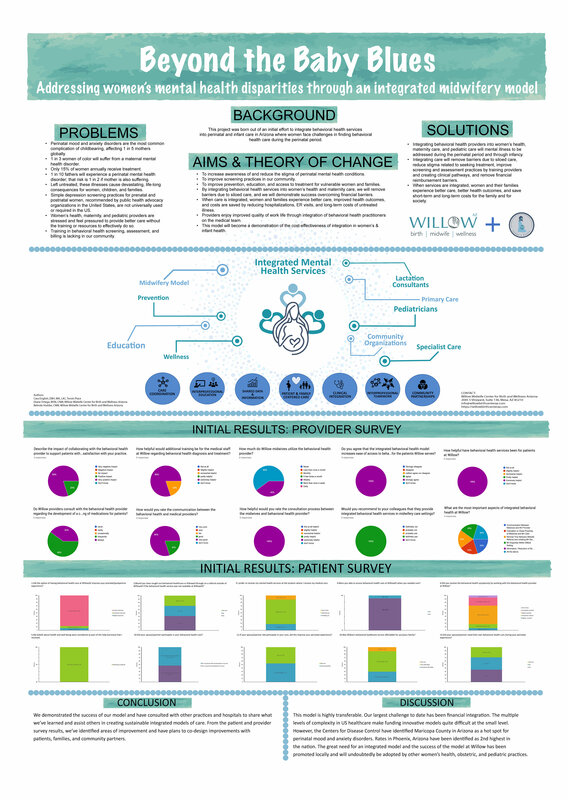 In our own Phoenix community, the midwife-owned practice Willow Midwife Center for Birth and Wellness has joined with Terra’s Place to offer integrated women’s health and perinatal health services, for which a poster was offered at the conference by owners Belinda Hodder and Diane Ortega, as well as myself as staff Doctor of Behavioral Health (click to view abstract). We were thrilled to see so many other examples of midwife-led improvements across the globe, and also inspired by the many posters exemplifying improvements for older adults and other vulnerable populations the world over. Next, emerging research in closing gaps in integration workforce development, leadership, and management was another major theme of this congress, exemplified by presentations by the IFIC Special Interest Group (SIG) in Education and Training as well as the young researchers in the newly established Emerging Researchers in Integrated Care (ERIC) organization. IFIC has over 17 SIG’s on a number of topics that might be of interest to you or your organization, and joining one or more SIGs is highly recommended. Should you have interest in joining the SIG on Education and Training in Integrated Care, please email myself or Anne Wojtak. Without a doubt, there is a new generation of researchers and practitioners leading, engaging senior researchers in new ways of support, asking great questions, and setting the stage for career growth. I highly encourage you to be part of this movement. Finally, one of the best presentations I attended focused on recent research in Leadership and Management Competencies in Integrated Care. Dr. Anne Wojtak of University of Toronto along with Jodeme Goldhar presented research on competencies needed to collaborate for systems-focused change. To these researchers, this means that leaders and managers must transition from being self-focused to being system-focused, and from transaction-focused to relationship-focused. Their research focused on the evidence for changing our view of patients and caregivers as recipients to patients and caregivers as partners in co-designing healthcare delivery as the key to advancements in integrated care design and delivery. These researchers challenged the audience to ask, “What can we do together with our communities to solve problems?” and to think from a perspective of collective impact or co-production. This, they propose, is the seismic shift in integrated care that is happening now in many systems and will be expected globally as the next wave in integration. In order to arrive at this point, Wojtak and Goldhar pointed to the shift that must occur from Old Power, held by few, to New Power, shared and owned by many. Goldhar referred to New Power as a “current,” which will carry integration and healthcare innovation forward. This is a powerful metaphor that inspired me to think in new ways about community collaboration, empowerment, and engagement. I encourage you to review their research for more information. So, what are the new skills and roles that are needed in integration leadership and management? Wojtak and Goldhar propose that we need people who are comfortable asking patients what is most important to them and ensuring that the care we deliver focuses on those values. We need leaders who are comfortable sharing power; in traditional healthcare, we saw leaders as the “sage on the stage,” but this isn’t what we need anymore. Now, we need leaders who can empower, coach, and help others to become reflective learners who see the needs of those they serve and are able to make changes on the spot. Do we expect today’s leaders to have all of these characteristics? Well, my friends, this is where innovation in education and training in integrated care becomes critically important. As I’m sure you’ve concluded, the way of the future presented by Wojtak and Goldhar is certainly not the traditional model that most leaders have “grown up” in, and few training programs have presented this model. As such, the researchers propose that we look to the Rainbow Model of Integrated Care (RMIC), and rethink how we recruit, educate, and support our leaders and staff. Wojtak and Goldhar suggest we ask ourselves how we are preparing our healthcare leaders to coproduce, help others, lead teams, empower a shared vision, and work together towards a common goal. To me, these are incredibly inspiring challenges that will deeply impact the curriculum at Cummings Graduate Institute. I have absolute confidence in our students’ passion for population health and aspirations of accomplishing Quadruple Aim improvements; however, the research of Wojtak and Goldhar nudges our conversations to grow more systems-oriented in our efforts to create lasting change. As always, I am thinking “big, thinky-thoughts,” thanks to my experiences at ICIC19. I do love to be pushed outside the bounds of what I’ve previously considered, and to look at healthcare innovation through new lenses. I can always count on ICIC to do just that, and this year delivered in droves.